Common signs include impact noises, excessive vibrations, and engine movement. Engine mounts are the component responsible for securing the engine of a vehicle to the chassis. They come in a variety of shapes and sizes to fit a wide variety of needs, but they all serve the same purpose of mounting the engine and dampening engine vibration. They are usually made of metal and rubber. Metal is used to be able to withstand the force and torque generated by the engine, and rubber is used to absorb and dampen the vibrations. As engines generate a considerable amount of vibration in their regular operation, when there is a problem with the motor mounts, it can usually be quite noticeable. Usually problematic motor mounts will produce a few symptoms that can alert the driver of a potential issue that should be serviced. One of the most common symptoms associated with worn engine mounts are impact noises coming from the engine bay. 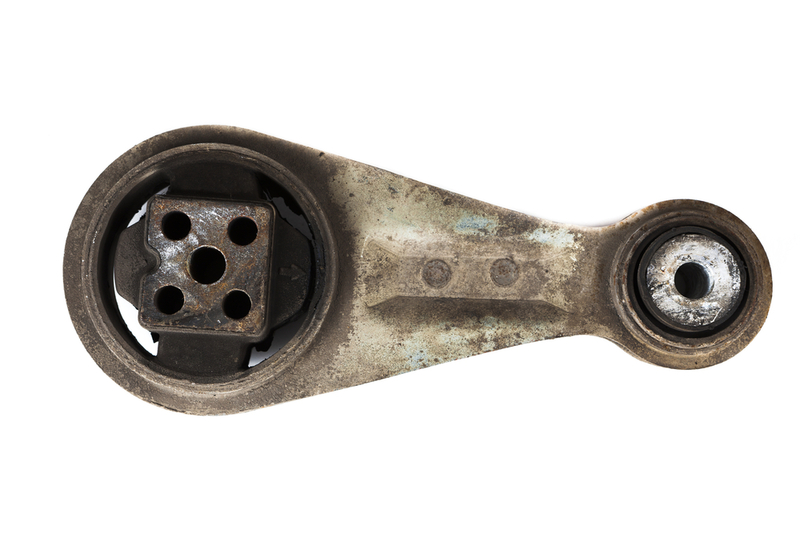 Worn, damaged, or broken motor mounts can cause clunking, banging, and other impact type sounds as a result of the weight of the engine shifting excessively to the point of contact. Another symptom of a bad or failing motor mount is excessive vibration. If the rubber or vibration dampening parts of the motor mount wear out or break, it will significantly reduce the mounts ability to absorb engine vibrations. Undamped engine vibrations will cause the entire vehicle to vibrate, which may make the cabin uncomfortable for the passengers. Another symptom of bad or failing engine mounts is an engine that moves in the engine bay. If the engine mounts are in good condition, they should be able to secure the engine firmly in the engine bay. If they are worn or broken, however, this may result in an engine that will move forward, backwards, or side to side in the engine bay. The movement may be especially pronounced when accelerating, and may also be accompanied by an impact noise of some sort. Due to the amount of vibration that engines generate as part of their regular operation, motor mounts are an important component on any vehicle. When they fail, this will not only make the cabin uncomfortable for the passengers, it can also place an additional strain that can damage other components. If you suspect that your motor mounts may be having an issue, have the vehicle inspected by a professional technician, such as one from YourMechanic. They will be able to look over your vehicle and determine if it needs an engine mount replacement.